At a recent Nassau Suffolk Water Commissioners’ Association (NSWCA) meeting sponsored by the Jericho Water District, the Association elected a new board for the 2017 term, which runs through December 31, 2017. Commissioners Anthony J. Cincotta, Thomas A. Abbate and James Asmus represented the Jericho Water District along with Superintendent Peter F. Logan. 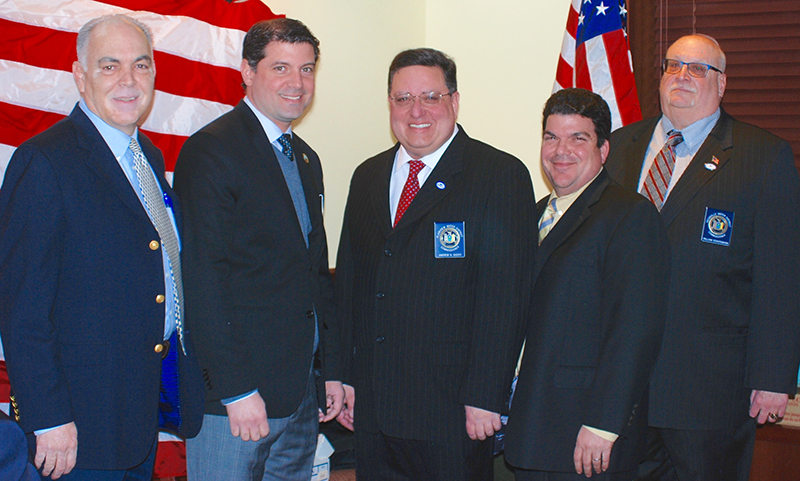 The newly elected NSWCA 2017 board includes: New President Andrew N. Bader of Plainview Water District, who succeeds outgoing President Raymond J. Averna of the Massapequa Water District; 1st Vice President Vincent Abbatiello of the Westbury Water District; 2nd Vice President Michael F. Rich III of Oyster Bay Water District; Secretary William Schuckmann of Hicksville Water District, and Treasurer Kenneth P. Wenthen Jr. of the West Hempstead Water District. 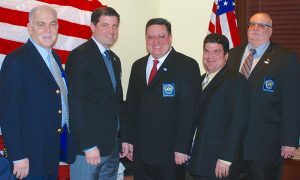 Left to Right: Treasurer Kenneth P. Wenthen Jr. of West Hempstead Water District; 2nd Vice President Michael F. Rich III of Oyster Bay Water District; New President Andrew Bader of Plainview Water District, who succeeds outgoing President Raymond J. Averna of Massapequa Water District; 1st Vice President Vincent Abbatiello of Westbury Water District; Secretary William Schuckmann of Hicksville Water District.